When high-quality porcelain veneers are properly cared for, they can last for decades. 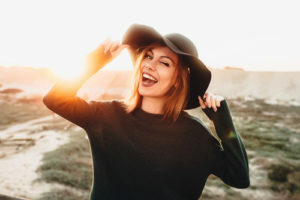 Beverly Hills cosmetic dentist Michael Kosdon, DDS receives lots of questions from patients, and even individuals online, seeking advice about the best ways to care for veneers. First off, it is important to know what type of veneers you have or are planning to get. If your veneers are made from 100% porcelain ceramic, which is very similar to enamel, they are likely very resistant to staining, discoloration, scratching, and chipping. Dr. Kosdon generally recommends that his patients choose high-quality ceramic materials, like feldspathic porcelain and e.max®, for their durability and superior aesthetics. He points out that some dentists may offer composite resin veneers that cost less, but lack the strength and cosmetic integrity of all-ceramic materials. Generally speaking, individuals with composite resin veneers need to be more aware of how they care for their veneers in order to extend their longevity. Dental hygiene products: For those with all-ceramic veneers, any type of toothbrush or toothpaste should be safe to use. Individuals with composite veneers should try to avoid abrasive toothpastes and firm bristled toothbrushes. For all veneers, Dr. Kosdon encourages patients to use the Sonicare® electric toothbrush, which has been proven to remove more plaque than traditional toothbrushes. Daily maintenance: Brush and floss at least twice daily. You should be able to care for your veneers the same way you would care for your natural teeth. Professional cleanings: Dr. Kosdon advises patients with veneers to see their dental hygienist for a cleaning at least three times per year to ensure healthy gums and teeth. This is also helpful to detect any complications with your veneers while they are in the early stages, so that potential problems can be resolved quickly. Nighttime protection: The best insurance against damaging your veneers during sleep is making a small investment in a custom nightguard. This easy-to-wear plastic mouthpiece will prevent the forces generated by involuntary nighttime teeth grinding and clenching from harming your veneers. If you have more questions about porcelain veneers or would like to schedule a consultation with Dr. Kosdon, please contact our office. « How Long Do Porcelain Veneers Last?